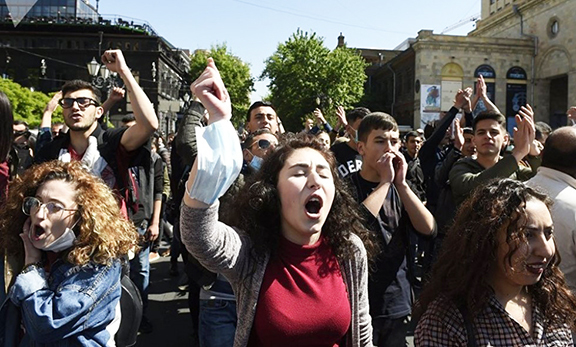 ISTANBUL—The demolition of a former camp for Armenian orphans has been halted due to public protests with activists preparing to spend the night at the site to prevent further attempts to demolish the building, Today’s Zaman reports. Around 10 a. m. on Wednesday, bulldozers entered Camp Armen — a former summer camp for Armenian orphans in the Tuzla district of Istanbul — to demolish the building in order to build luxury residences in its place. According to a news report from the Armenian weekly newspaper Agos, the construction machines have already demolished five bedrooms, the camp director’s room, the chapel and some of the surrounding fences. However, demolition work was halted with the intervention of concerned citizens including Garo Paylan and Sezin Uçar, parliament candidates from the opposition Peoples’ Democratic Party (HDP) and Ali Çelik, the Tuzla district head of the main opposition Republican People’s Party (CHP), Hurriyet Daily reports. Orphan children working during the construction of a dormitory at Camp Armen.